Mars has electrically charged metal atoms (ions) high in its atmosphere, according to new results from NASA's MAVEN spacecraft. The metal ions can reveal previously invisible activity in the mysterious electrically charged upper atmosphere (ionosphere) of Mars. "MAVEN has made the first direct detection of the permanent presence of metal ions in the ionosphere of a planet other than Earth," said Joseph Grebowsky of NASA's Goddard Space Flight Center in Greenbelt, Maryland. "Because metallic ions have long lifetimes and are transported far from their region of origin by neutral winds and electric fields, they can be used to infer motion in the ionosphere, similar to the way we use a lofted leaf to reveal which way the wind is blowing." Grebowsky is lead author of a paper on this research appearing April 10 in Geophysical Research Letters. 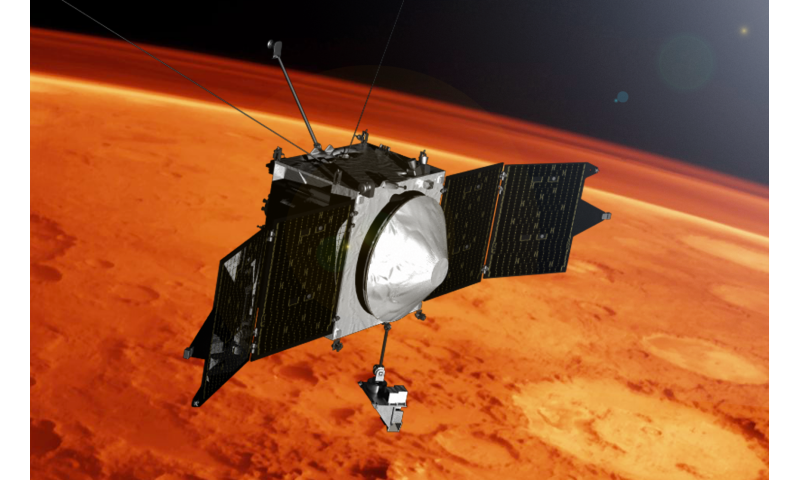 MAVEN (Mars Atmosphere and Volatile Evolution Mission) is exploring the Martian upper atmosphere to understand how the planet lost most of its air, transforming from a world that could have supported life billions of years ago into a cold desert planet today. Understanding ionospheric activity is shedding light on how the Martian atmosphere is being lost to space, according to the team. The metal comes from a constant rain of tiny meteoroids onto the Red Planet. When a high-speed meteoroid hits the Martian atmosphere, it vaporizes. Metal atoms in the vapor trail get some of their electrons torn away by other charged atoms and molecules in the ionosphere, transforming the metal atoms into electrically charged ions. MAVEN has detected iron, magnesium, and sodium ions in the upper atmosphere of Mars over the last two years using its Neutral Gas and Ion Mass Spectrometer instrument, giving the team confidence that the metal ions are a permanent feature. "We detected metal ions associated with the close passage of Comet Siding Spring in 2014, but that was a unique event and it didn't tell us about the long-term presence of the ions," said Grebowsky. The interplanetary dust that causes the meteor showers is common throughout our solar system, so it's likely that all solar system planets and moons with substantial atmospheres have metal ions, according to the team. Sounding rockets, radar and satellite measurements have detected metal ion layers high in the atmosphere above Earth. There's also been indirect evidence for metal ions above other planets in our solar system. When spacecraft are exploring these worlds from orbit, sometimes their radio signals pass through the planet's atmosphere on the way to Earth, and sometimes portions of the signal have been blocked. This has been interpreted as interference from electrons in the ionosphere, some of which are thought to be associated with metal ions. However, long-term direct detection of the metal ions by MAVEN is the first conclusive evidence that these ions exist on another planet and that they are a permanent feature there. The team found that the metal ions behaved differently on Mars than on Earth. Earth is surrounded by a global magnetic field generated in its interior, and this magnetic field together with ionospheric winds forces the metal ions into layers. However, Mars has only local magnetic fields fossilized in certain regions of its crust, and the team only saw the layers near these areas. "Elsewhere, the metal ion distributions are totally unlike those observed at Earth," said Grebowsky. The research has other applications as well. For example it is unclear if the metal ions can affect the formation or behavior of high-altitude clouds. Also, detailed understanding of the meteoritic ions in the totally different Earth and Mars environments will be useful for better predicting consequences of interplanetary dust impacts in other yet-unexplored solar system atmospheres. "Observing metal ions on another planet gives us something to compare and contrast with Earth to understand the ionosphere and atmospheric chemistry better," said Grebowsky. Re: "The interplanetary dust that causes the meteor showers is common throughout our solar system, so it's likely that all solar system planets and moons with substantial atmospheres have metal ions, according to the team." Welcome to the uniformitarian assumption, brought to you by a political battle waged a quarter millenium ago. Now served as a hidden assumption within all of your textbook theories. It serves your desire to believe that your surroundings will not change, that you can live your life without having to worry about something out of all of our control. Nevermind the huge gash across Mars or its various debris fields. Nevermind that Venus is emitting 15-20% more heat than it takes in, and that this heat comes from its surface. Nevermind the large debris field surrounding Mars. Nevermind the mammoth tusks peppered with meteorites or the black radioactive mat on a mammoth carcass or their genetic damage. Everything was always this way. There goes Hannes_Reeve tilting at windmills again - either with great patience or using a script he wrote to puke out more text every three minutes. Unfortunately for him, Uniformitarianism is dead. Evidence of catastrophes had slowly accumulated over time, but the dam broke, metaphorically and physically, with the discovery of the channeled scablands of eastern Washington state and realization that the cause was an enormous glacial Lake Missoula repeatedly bursting a glacial dam and unleashing floods of sizes unlike anything seen in modern times. Modern geology is accepting of catastrophes - if they have solid evidence. Witness Chicxulub, the dinosaur-killing asteroid, radioactive iron in the ocean being traced to a 2 million year old supernova, the flooding of the Black Sea basin, etc..
i'm surprised he isn't calling himself "the electric Don"